Genealogy Day at Brandon Public Library 2018 | Southwest Branch - Manitoba Genealogical Society Inc. 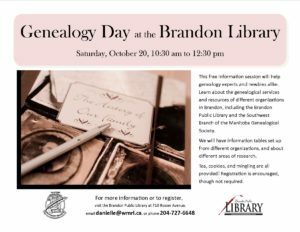 The Brandon Public Library and the South West Branch, Manitoba Genealogical Society are hosting a “Genealogy Day” at the Brandon Public Library, 710 Rosser Avenue, October 20th, 10:30 am – 12:30 pm. This event will help researchers learn about genealogical resources available in Brandon and online Canadian Records. A representatives from City of Brandon Cemetery to give information about the cemetery and answer questions. There will be a tour of the library highlighting the genealogy resources found at the Brandon Public Library which will include: using the microfilm reader to access the newspaper and census collections and learn about South West Manitoba oral history collection as well as the community history books and local historic directories. Members of the SWB Manitoba Genealogical Society will be on hand to help answer questions relating to genealogical research and about our society. For more information or to register visit the library at 710 Rosser Ave in Brandon, call the Brandon Public Library at 204-727-6648 or email danielle@wmrl.ca.